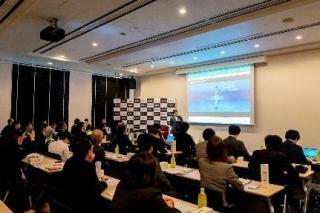 On October 24th, 2018, Shinshu University and Toclas Corporation (headquartered in Hamamatsu city, Shizuoka) announced at a press conference that the portable water purifier bottle "NaTiO" would be launched on December 25th as a first step of commercial use of the world's first material, which was developed through collaboration and capable to remove heavy metals from water using Shinshu University's world leading technology for crystal growth - "Flux method". "Na2Ti3O7", the world's first heavy metals adsorbent, is a powder inorganic crystalline material that has a property to remove a wide variety of heavy metal ions quickly and effectively with a small quantity, and it demonstrates high performance even with a small cartridge compared to the conventional product. Collaboratively filed patents in 2010 and 2016 were granted, mass production and product launching were achieved by Toclas Corporation. 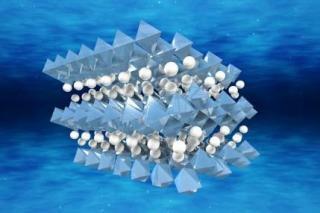 This is the first commercialization of crystalline materials produced by the Shinshu University's Flux method. R&D project of the heavy metal ions adsorbent and water purifier was implemented in "Global Aqua Innovation Center", supported by the Center of Innovation program of JST, and the scale-up strategy was promoted by "A Shinshu-Method for Regional Innovation Ecosystem by Industrial Implementation of Innovative Inorganic Crystal Material Technology", supported by the Regional Innovation and Ecosystem Formation Program of MEXT. 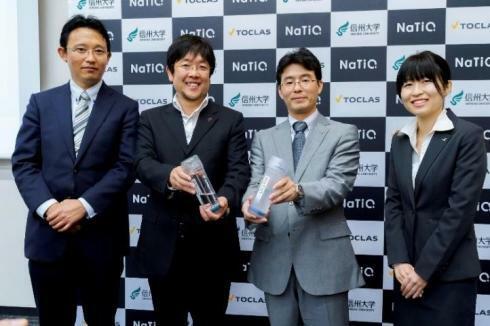 Shinshu University and Toclas Corporation plan to expand the line-up of water purifier "NaTiO" to various types including spout-in type and under-sink type after launching the portable bottle type. Furthermore, as an effort for "Goal 6: Ensure access to water and sanitation for all", one of the UN's "Sustainable Development Goals (SDGs) ", we develop inexpensive filter media, such as tea bag type, that can be delivered to BOP (bottom of the pyramid) countries. Targeting various toxic substances, we will make continuous effort to develop and implement the water purifier materials according to the water situation of each country. 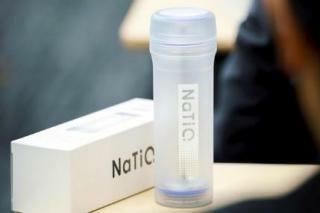 Portable Water Purifier Bottle "NaTiO"